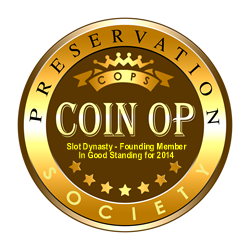 From the estate of Burton Cohen, former president of the Desert Inn and Flamingo Casinos in Las Vegas, I have acquired a Golden Nugget nickel slot. It has been in a locked storage unit at Mr. Cohen's residence for the past 30 years and is in excellent condition considering its age. I know it to be genuine as I played it over 30 years ago when it sat on the bar of his house on the Desert Inn golf course. It was in working condition as of yesterday morning when I left Las Vegas to return home to NY. The machine is in transit to me at this time. What was not available is the key. It needs to be opened as it is so full of nickels , probably 50 years worth, that it weighs a ton and is going to jam if not emptied. Question #1 is can a locksmith cut a blank to fit or am I better off purchasing a matching lock and key from EBay? Second question is what appears to be a keyhole in the front. Does this actually open anything? None of the online video I find makes mention of this. I am sure I will have more questions when I actually have it in my possession but for now opening it is paramount. Nice looking machine but it should NOT BE SHIPPED full of nickels!! Ups and fed ex will turn that thing upside down and on every side of the container unless it is palletized. Nickels will come out of everywhere and can mess up the inside of your new treasure. Hope it makes it ok good luck and welcome to forum. can look up the history of this model, by searching elsewhere in this Forum. of it's safe arrival. I'll cry right along with you, if this machine gets destroyed. me direct at (slotdynasty@sbcglobal.net). Good luck. 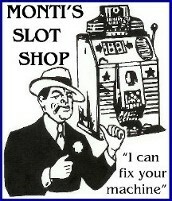 very nice slot for sure. the Previous owners name really sounds familiar ...... nice you were able to get it ! more photos later please ! Have a special place to display it ,when it gets home ? JHSS-1944 wrote: Welcome to the forum !!! The previous owner's name would sound familiar to anyone with an interest in the history of old Las Vegas. Mr. Cohen headed up the Desert Inn, the Flamingo, and several other old Vegas hotels and casinos during his tenure. He was also responsible for bringing television to LV and the show Vegas with Robert Urich. His name was frequently heard being paged on the show. He was my brother-in-law and for personal reasons I wanted to get the machine out of storage and back to NY as soon as possible. I did not want it professionally restored out there because it is in amazing condition...and I am holding my breath that it makes its journey intact, despite being full. Will update upon receipt. Update: the machine survived the trip from Las Vegas totally intact, thanks to excellent packing by BOX BROTHERS. I am sure UPS turned it on its head once or twice because there were nickels everywhere. 2" of foam, blanketed, styrofoam, box 1...then repeated in larger box. I am fortunate from what I have read but thankfully no damage whatsoever. No key meant getting a locksmith...a REAL locksmith with an interest in antique machine locks and an appreciation for the machine. He picked for two hours with no luck. Came back on day two and carefully drilled the lock. I purchased a genuine Mills numbered lock and key on EBAY which was a big help for him during the drilling process and once opened, the replacement lock was a perfect match. The escalator was jammed up but by watching a video or two I was able to free it up. Removing the mechanism was simple as well. That is where I am at this point. I will be reading and watching more online for the next few days. Everything in the machine seems intact. Will post some pics now for any insight / input from you experts! All suggestions appreciated! Good to hear it arrived in untouched shape. very clean inside & out , a nice plus. thank you for sharing these images ! 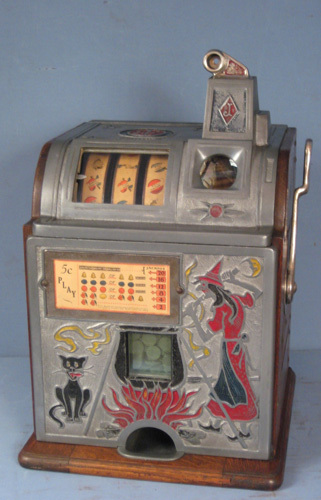 Any follow-up on this machine? I'd like to know how everything turned out. Hope all is well in Montana! This original post was from 2016 so he has probably already taken care of all his issues but he was a Lucky Guy to find a Real Golden Nugget with all the Reproductions being sold out there as being "REAL" as these original Golden Nuggets are few and far between as there were not that many originally and this one had some Great History as well being previously owned by Burton Cohen of Las Vegas history himself! Most, if not all of the Original Golden Nuggets are in the hands of avid collectors I would guess and do not show up often! I don't know if the original poster of this thread is still active here but I would like to see some recent pictures of this Original Golden Nugget after he restored it as in 35 Plus years I have only seen two of them come thru my shop!